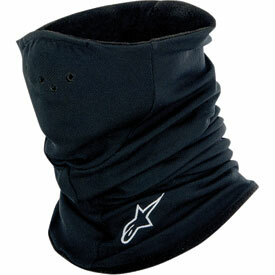 Elasticated insert on the nose to help hold warmer in position. Strategically positioned air holes for breathability. Alpinestars logo embroidered on lower front. Not windproof, but thick enough and comfortable. Quality build. Breathable. Neck warmer is a must have in Maryland in the winter. Tucks into your collar, light weight and keeps the wind and cold off your neck. I'm 6'2 195 pounds average size and it fits snug on my neck. Takes a little effort to keep it pulled up around your face when putting on your helmet but that should be expected. A little pricey! Still would recommend.